Registering custom post types should be relatively easy for you. Just visiting the WordPress Codex to see what arguments to set or you may even use some cool GUI tools to write the snippets much quicker. Courses need to be hierarchical because we can only use the wp_dropdown_pages() (more on this soon) to get the courses if it’s hierarchical. Lessons can’t be hierarchical because if so WordPress will use a different way to process its permalink and that’ll break the URL structure hacks we’re going to use. This step is kind of cool that, by default a post type needs to be hierarchical and also supports “page-attributes“, to get the “Parent” field (meta box) to set the parent post, which is a select box to display a bunch of posts to choose from. 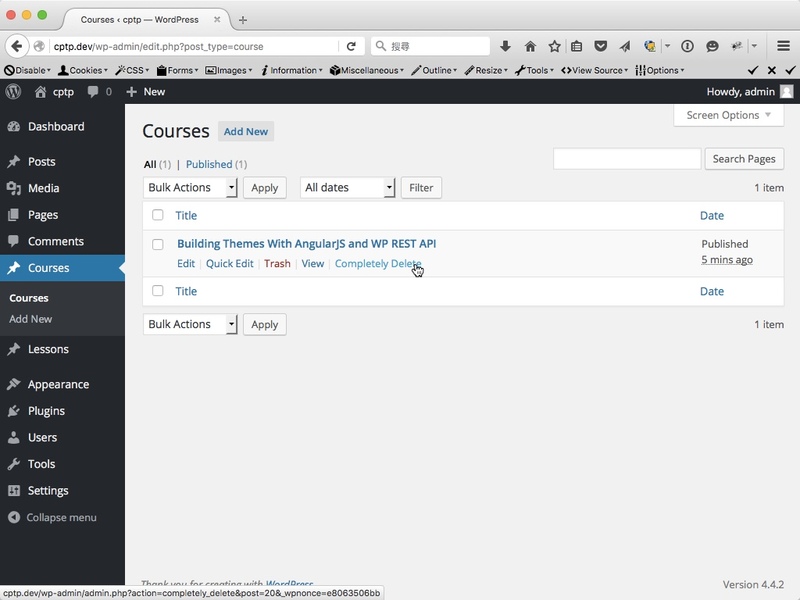 Since we didn’t set the Lessons to be hierarchical, we can’t have WordPress to create the field for us. But we can create our own Parent post field by registering a new meta box for it (line 2-5). And even more, by naming the select to “parent_id” (line 9, wp_dropdown_pages() can be not only used to get pages, but also any other hierarchical post types), a default filed name that all hierarchical post type has in common, we don’t have to write an extra function to save the value to post meta, WordPress will process that automatically. To build a custom URL structure for our CPT, there are three functions to do the job: add_rewrite_tag, add_permastruct and add_rewrite_rule. If you have ever set the permalinks in your WordPress Settings, you must be familiar with built-in URL structure tags like “%year%“, “%monthnum%“, “%day%” or “%postname%“, which must start and end with a % symbol. Now in our case we’re going to create a new structure tag “%lesson%“, so we can use it to build the custom URL structure for “Lessons” post type. The next is to use add_permastruct() to create a new permalink structure for the “Lessons” post type. Here we use a structure tag “%course%” that doesn’t really exist (we didn’t register it with add_rewrite_tag). Because we don’t really want to use it globally in WordPress, it’s just like a shortcode so we can replace it with the real course name (the lesson’s parent) in the next step. And then we need to create a new rewrite rule that tells WordPress, when someone visits URLs in this very format (/lesson/%course%/%lesson%/), WordPress should redirect them to another URL (/index.php?lesson=%lesson%), which is the true URL with query strings (a.k.a. the ugly link) so WordPress can actually do the queries and fetch posts for us. The fun part is we don’t really need every tag in the URL structure to be in part of the query strings. In our case, we need only %lesson% but not %course%, in fact, we can even say %course% is totally useless for WordPress to fetch this singular post, we use it to decorate the URL so our visitors will know “this lesson belongs to that course“. With only %lesson%, the query can work fine. In the final step, we have to update the permalink for the Lessons post type. Here comes a powerful filter called post_type_link, we can use it to modify the permalink for any post type in WordPress. Now the most important task left is to interpret %course% tag into the slug of the parent course we’ve set. You can see the gist above and that’s what line 7-10 is for. My plugin Completely Delete is made to better manage hierarchical posts. With it you can delete a parent post and also all its child posts (include attachments) at the same time. So it would be very helpful in our case, when trashing or deleting a certain course, all lessons can be gone with it. Now things should work as I’ve promised you at the beginning of this tutorial. Check the demo screencast and see it actually works! Also, you can grab the full functions.php you need for this project. I hope you enjoy this tutorial and learn something new with me. The Lunar New Year in Taiwan is coming and I wish everyone read so far will have an awesome Monkey Year! Leave comments or shoot me an email (yoren [at] 1fix.io), I’ll get back to you ASAP even when I’m on a 9-day vacation. I’m probably going to try this myself after writing… but thought i’d ask you as well in case i fail! … could this method be extended to 3 post types and this different URL structure? Essentially i have Games, Characters, Movesets as post types. I believe so. Just you need some time to test around the rewrite rules. Good luck! Hmm i’m not sure … my first attempt seems to be suggesting the Moveset post can’t have parents from 2 other post types. ie on the post edit screen only one parent gets saved. Great tutorial, the url rewrites seem to be affecting the entire site by redirecting everything to the home page if the url does not match the /lesson/course structure. Hi Jonathan, I just tested on my local dev machine but it worked well with a new post type I created. I suppose you have a more complex URL structure so the permalinks might conflict with each other. Great article man. It really helped me connect two custom post types I had on my project. Hey Eric, Glad I can help! I have many parent post and i can not choose parent post because its very long. How to limit and search drop box with ajax. Hi, Chung, sorry for the late reply. To integrate AJAX into the parent metabox is out of the scope of this post. Sorry about that. Thanks for this working well. Only one issue though, when I set my custom permalinks using the code above all the child posts use the parent pag template. I cant even target the child post type via php. The child is named low_profile and parent is vehicle. Managed to fix it up, was changing the permalink and wordpress got confused. hey Kyle, good to know you got it figured out! Thanks for this great post ! It really helped me out. 2) The chapter works well if the permalinks are set “post name”, but not the book which redirect to 404. I would like it to work completely regardless of the structure selected. i’m running out of idea. So if you find time to give me an advice, I would really be very grateful. Oops. Some code has been pasted twice. Sorry, I can’t edit. Thanks, this is that I want. But instead of my course single page is showing my parents lesson single page, how can i solve this? +1 ! It is the same for me. Hey Aly, please read “3.Setting the exactly URL structure” carefully that it depends on how you set the whole “my_add_rewrite_rules” function. Everything is connected here and it’s a very tricky one! Hello, great job, thank you. How can we add “featured image” to this post types? This was so helpful and smart. Keep on coming with these great solutions. I have been looking for a way to make 2 custom post types communicated and you explained it so well. my question then becomes, how do you loop through the courses CPT with PHP? How does it know that lessons are attached to courses? By checking the post_parent we can see the connections then. Hi, thank you very much for he detailed post. I have a question though, I want to add another column to the admin page so I can filter the seccions by the parent post. Is it possible? if so, can you point me some direction? Hi, Thank you for a very useful post. But I’ve an issue that I dont get a different slug for posts with same title. WordPress append 1,2,3… for duplicate posts.How can I solve this? Hey Anisha, I don’t think you have to “solve” that. Can’t relate much in such scenario. That is something that needs to be solved, as you cannot have two posts (lessons) with the same name, even when the slug (course) is different. First of all, thank you so much for share with everyone your knowledge! Your post works very well for me. But why if I want to parent more than one post? For example, choose “course” and “teacher” as the parent post for a “lesson”. It doesn’t work because WordPress only save one of them (course or teacher). I could tell the problem is in the “name” of the select. I’ve tried to change the name (parent_id) but it didn’t work either. Maybe it wasn’t the right way to fix it :P.
Can you help me please? Thanks in advance! You are a lifesaver. Thank You so much. ^that gives a 404, but it’s what wordpress tries to set, I do all the saving in permalink section, too. i then try the post_type_link filter and it creates 404s still.